Dynamic modulation of prohormone convertase 2 (PC2)-mediated precursor processing by 7B2protein: preferential effect on glucagon synthesis. The small neuroendocrine protein 7B2 is required for the production of active prohormone convertase 2 (PC2), an enzyme involved in the synthesis of peptide hormones, such as glucagon and proopiomelanocortin-derived α-melanocyte-stimulating hormone. However, whether 7B2 can dynamically modulate peptide production through regulation of PC2 activity remains unclear. Infection of the pancreatic alpha cell line α-TC6 with 7B2-encoding adenovirus efficiently increased production of glucagon, whereas siRNA-mediated knockdown of 7B2significantly decreased stored glucagon. Furthermore, rescue of 7B2 expression in primary pituitary cultures prepared from 7B2 null mice restored melanocyte-stimulating hormone production, substantiating the role of 7B2 as a regulatory factor in peptide biosynthesis. In anterior pituitary and pancreatic beta cell lines, however, overexpression of 7B2 affected neither production nor secretion of peptides despite increased release of active PC2. In direct contrast, 7B2 overexpression decreased the secretion and increased the activity of PC2 within α-TC6 cells; the increased intracellular concentration of active PC2 within these cells may therefore account for the enhanced production of glucagon. In line with these findings, we found elevated circulating glucagon levels in 7B2-overexpressing cast/cast mice in vivo. Surprisingly, when proopiomelanocortin and proglucagon were co-expressed in either pituitary or pancreatic alpha cell lines, proglucagon processing was preferentially decreased when 7B2 was knocked down. Taken together, these results suggest that proglucagon cleavage has a greater dependence on PC2 activity than other precursors and moreover that 7B2-dependent routing of PC2 to secretory granules is cell line-specific. The manipulation of 7B2 could therefore represent an effective way to selectively regulate synthesis of certain PC2-dependent peptides. Helwig M, Lee SN, Hwang JR, Ozawa A, Medrano JF, Lindberg I. J Biol Chem. 2011;286(49):42504-13. Regulation of cell growth and expression of 7B2, PC2, and PC1/3 by TGFbeta 1 and sodium butyrate in a human pituitary cell line (HP75). Recent studies have shown that 7B2 and the neuroendocrine- specific proconvertase PC2 have important roles in pituitary cell proliferation and hormone secretion. Studies from our laboratory have also shown that TGFb1 regulates anterior pituitary cell proliferation and hormone secretion. To study the regulation of 7B2 in human pituitary tumors, we used a cell line derived from a human pituitary adenoma (HP75) that has been shown to express 7B2, PC1, PC2, and TGFbeta receptors to analyze the effects of TGFbeta1 and the histone deacetylase inhibitor (HDACI) sodium butyrate (NaB) treatment on 7B2 mRNA expression along with the neuroendocrine-specific proconvertases 1/3 (PC1) and PC2 mRNA and protein expression. RNA was quantified by real-time PCR and proteins were detected by immunohistochemistry and Western blotting. Treatment of cells with 1 mM NaB or 1 nM TGF 1 for 4 d decreased cell proliferation with a concomitant increase in the cell cycle protein p21. Real-time PCR analysis showed a significant increase in 7B2 mRNA after NaB and TGFbeta1 treatment. PC2 mRNA was down regulated by NaB while PC1 mRNA was unchanged. TGFbeta1 stimulated PC1, but not PC2 mRNA levels. Changes in PC1 and PC2protein were similar to changes in the mRNAs, but the differences were not significant. These results indicated that NaB and TGFbeta1 inhibit pituitary cell proliferation and regulate the expression of 7B2, PC1, and PC2 in a cell culture model of pituitary tumors. Our results also indicate that inhibition of pituitary cell proliferation is associated with increased expression of 7B2 mRNA. Kobayashi I, Jin L, Ruebel KH, Bayliss JM, Hidehiro O, Lloyd RV. Endocrine. 2003;22(3):285-92. Prohormone convertase 2 enzymatic activity and its regulation in neuro-endocrine cells and tissues. We used the fluorometric substrate, pGlu-Arg-Thr-Lys-Arg-MCA and the C-terminal peptide of human 7B2(155-185), a specific inhibitor of prohormone convertase 2 (PC2), to specifically measure the enzymatic activity of the prohormone convertases, PC2. Using lysates from the pancreatic alpha cell line, alphaTC1-6 cells, which contain moderate levels of PC2 enzymatic activity, we determined that the PC2 assay was linear with respect to time of incubation and protein added and had a pH optimum of 5.5 and a calcium optimum of 2.5 mM. Rat pituitary contained high levels of PC2 enzymatic activity, while the hypothalamus and other brain regions contained moderate levels. This enzyme assay was used to document that both mice null for PC2 as well as mice null for the PC2 cofactor, 7B2, had only trace levels of PC2 activity in various brain regions, while mice heterozygous for these alleles had approximately half of the PC2 activity in most brain regions. PC2 enzymatic activity and PC2 mRNA levels were somewhat discordant suggesting that PC2 mRNA levels do not always reflect PC2 enzymatic activity. 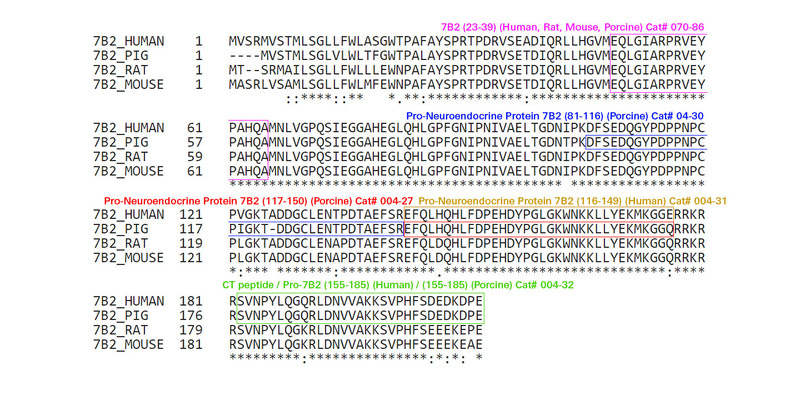 Neuroendocrine secretory protein 7B2: structure, expression and functions. 7B2 is an acidic protein residing in the secretory granules of neuroendocrine cells. Its sequence has been elucidated in many phyla and species. It shows high similarity among mammals. A Pro-Pro-Asn-Pro-Cys-Pro polyproline motif is its most conserved feature, being carried by both vertebrate and invertebrate sequences. It is biosynthesized as a precursor protein that is cleaved into an N-terminal fragment and a C-terminal peptide. In neuroendocrine cells, 7B2 functions as a specific chaperone for the proprotein convertase (PC) 2. Through the sequence around its Pro-Pro-Asn-Pro-Cys-Pro motif, it binds to an inactive proPC2 and facilitates its transport from the endoplasmic reticulum to later compartments of the secretory pathway where the zymogen is proteolytically matured and activated. Its C-terminal peptide can inhibit PC2 in vitro and may contribute to keep the enzyme transiently inactive in vivo. The PC2-7B2 model defines a new neuroendocrine paradigm whereby proteolytic activation of prohormones and proneuropeptides in the secretory pathway is spatially and temporally regulated by the dynamics of interactions between converting enzymes and their binding proteins. Interestingly, unlike PC2-null mice, which are viable, 7B2-null mutants die early in life from Cushing's disease due to corticotropin ('ACTH') hypersecretion by the neurointermediate lobe, suggesting a possible involvement of 7B2 in secretory granule formation and in secretion regulation. The mechanism of this regulation is yet to be elucidated. 7B2 has been shown to be a good marker of several neuroendocrine cell dysfunctions in humans. The possibility that anomalies in its structure and expression could be aetiological causes of some of these dysfunctions warrants investigation. Mbikay M, Seidah NG, Chrétien M. Biochem J. 2001;357(Pt 2):329-42. Dissociation of the complex between the neuroendocrine chaperone 7B2 and prohormone convertase PC2 is not associated with proPC2 maturation. 7B2 is a highly conserved neuroendocrine protein that is associated with the proform of the prohormone convertase PC2 in the early stages of the secretory pathway in intermediate pituitary cells of Xenopus laevis. Subsequent processing of 7B2 and dissociation of the 7B2/proPC2 complex is thought to be associated with the conversion of proPC2 to the mature enzyme. Here, we report that, in both Xenopus and mouse intermediate cells, proPC2 maturation does not take place when the proenzyme is associated with the 7B2 precursor and that, in contrast to the previous notion, dissociation of the complex between proPC2 and the N-terminal 7B2 fragment precedes, and is thus not directly linked to, proPC2 maturation. In vitro, conversion of newly synthesized proPC2 was efficiently blocked by recombinant 7B2 and studies with truncation mutants indicated that a short segment in the C-terminal region of 7B2 is necessary and sufficient for this inhibitory effect. Our results indicate that, after 7B2 precursor processing and dissociation of the N-terminal fragment, the C-terminal fragment of 7B2 may remain associated with proPC2, thereby preventing autocatalytic conversion of the proenzyme until the appropriate site for activation in the secretory pathway is reached. Braks JA, Van horssen AM, Martens GJ. Eur J Biochem. 1996;238(2):505-10. Immunological identification and sequence characterization of a peptide derived from the processing of neuroendocrine protein 7B2. A newly raised antiserum against the C-terminal region of neuroendocrine protein 7B2 was used to purify a novel peptide from the culture media of the mouse corticotroph cell line AtT-20. Based on partial sequencing, this peptide, which we call Cter-7B2, begins at Ser156 and appears to result from the cleavage of pro7B2 after a five-basic-residue sequence. Thus, 7B2 processing may contribute to the diversity of peptides found in neuronal and endocrine cells. Paquet L, Rondeau N, Seidah NG, Lazure C, Chrétien M, Mbikay M. FEBS Lett. 1991;294(1-2):23-6. The Secretory Granule Protein 7B2 is Secreted in Parallel with Proopiomelanocortin and its End-Products by the Mouse Corticotroph Tumour Cells AtT-20. First isolated in porcine pituitary glands the protein 7B2 subsequently proved to be a specific biochemical marker of the secretory granules. Likewise 7B2 was detected in almost all normal and tumoral endocrine tissues. Unexpectedly, several authors failed to demonstrate its presence in rat and human adrenocorticotrophin (ACTH)-secreting cells. In order to definitely establish whether this cell type also produces 7B2 we chose the mouse pituitary corticotroph tumour cell line AtT-20 as a model. Serial dilutions of the mouse culture medium generated displacement curves parallel to that of the standard in a specific 7B2 RIA directed against the human 7B2(23-39) fragment. Under basal secretory conditions immunoreactive 7B2 accumulated in the culture medium in parallel with proopiomelanocortin (POMC) and its fragments N-terminal-joining peptide (NT-JP), joining peptide (JP), beta-lipotropin (beta-LPH), and beta-endorphin (beta-end), although at a much lower (approximately 100-fold) molar concentration. As expected mouse corticotroph cells responded to the stimulatory action of cyclic AMP (3.5 mM) with a preferential increase in the release of POMC end-products, JP and beta-end, which was accompanied by a parallel increase in immunoreactive 7B2 release. Vieau D, Tougard C, Rosenbaum E, Lenne F, Bertagna X. J Neuroendocrinol. 1991;3(3):229-31.